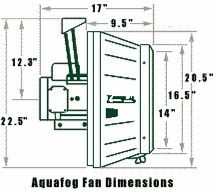 The XE-1000 (1/2HP, 60Hz) is perfectly suited for small to mid-size applications requiring 1-2 fogging fans. This model is a little quieter than the larger XE-2000, but still produces a good quality fog and is very energy efficient. XE-1000 is popular for lower volume fogging applications. These heavy duty foggers stand out as because they can handle: humidification, chemical application, and evaporative cooling - depending on the desired application. Water lines need not be pressurized, and well or even pond water can be used without fear of clogging the special atomization system. ****XE-1000 Fans are standard-equipped with a dark teal housing and a dual voltage, white epoxy painted wash-down-duty™ (WDD) motor 115/230V, 1ph, 60Hz. See “Motor Option” below for other motor options.